I’ve discovered that trying to find healthy side dish recipes (that taste good) is usually a challenge. Which I why I was so excited when my trainer, Cari Shoemate, posted this recipe on her blog last year. 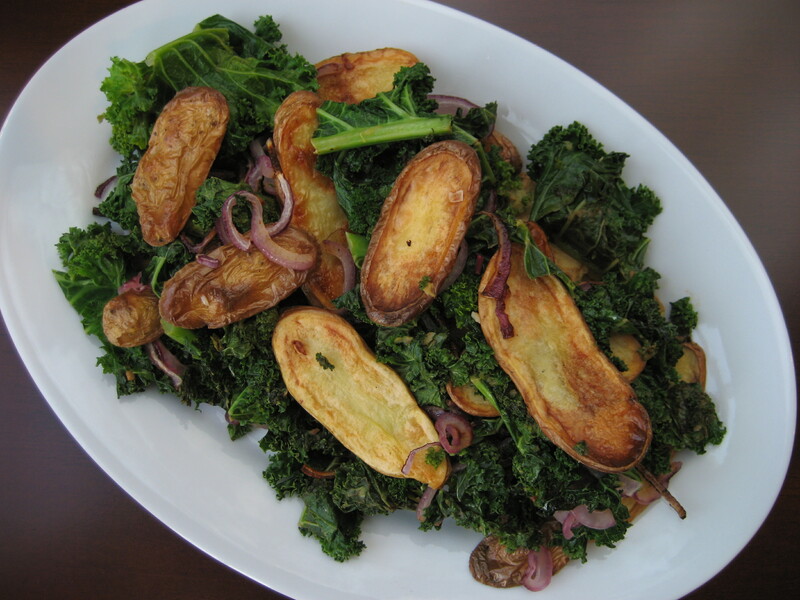 I had never tried kale before but I love potatoes, red onions, mustard, and lemon so I decided to give it a try. The fact that my trainer approved of this recipe was a plus too! I am so glad I tried this recipe because it has become one of my favorite sides to make when I cook fish. Cari has always pushed me to try new things. She once told me to explore the produce section and buy something you’ve never eaten before. I’m usually guilty of only sticking to my list during most of my trips to the grocery store. However, it’s nice to venture out and try something new every once in a while. It also makes me feel like Iron Chef because when I get home I try to come up with a use for what I bought. Except I’m pretty sure Iron Chef doesn’t use google to research how to prepare the secret ingredient. Do you like to experiment with foods you’ve never eaten before? Preheat oven to 450 degrees. Combine potatoes, 1 tablespoon oil and 3/4 teaspoon salt on a baking sheet. Season with pepper and toss. Spread mixture in a single layer (use second sheet if necessary). Roast for 15 minutes, then flip potatoes and add red onion. Roast for about 15 more minutes or until potatoes and onions begin to brown. Combine mustard, lemon zest and juice in a bowl. Heat remaining 2 tablespoons oil in a large skillet over medium-high heat. Add garlic and cook about 30 seconds, stirring constantly. Add kale and cook, stirring occasionally until wilted (about 6 min). Add mustard-lemon mixture; toss to coat. Cook until heated through. Sprinkle with 1/4 teaspoon salt and season with pepper. Toss with potatoes and serve. Awesome – thanks for sharing Kristen! I love your blog! I like how you use fresh ingredients and have recipes that appeal to everyone. Thanks Cari! I’m glad you like it! Wow! You really are a cooking expert! No wonder you knew what to do with the lemons weighing down the tree. What an amazing blog you have here!